A seminar at the UN climate negotiations, COP23, organized by CEMUS, Uppsala University and Stockholm Resilience Centre in collaboration with Mission 2020 & the Leonardo DiCaprio Foundation. If global CO2 emissions continue to rise beyond 2020, or even remain level, the temperature commitments set in Paris and the Sustainable Development Goals the world agreed to in 2015 become unattainable. On Tuesday, a panel of top experts will outline the unprecedented pace and scale of emissions reductions necessary to meet the Paris Agreement, and offer different interpretations of how the colossal mitigation challenge may yet be met. We’ll hear about the pathways to succeed, why climate change matters for everybody and how we all have agency to catalyse change. 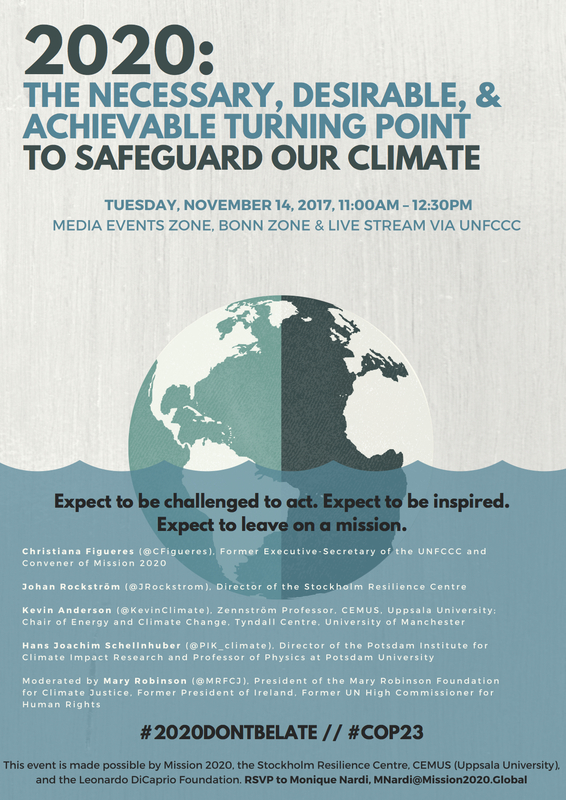 Where: Media Events Zone, Bonn Zone & live-stream via UNFCCC. A live-screening at Uppsala University Geo-biblioteket, and at the Conference Uppsala tar ansvar.